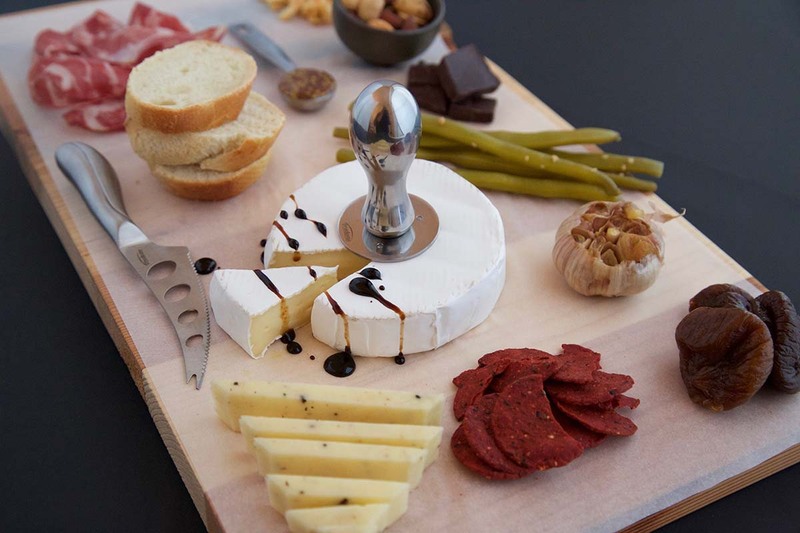 The art of building a cheese board isn’t complicated. With a little planning you can put together well balanced flavours that will leave your friends and family in awe. The first step is deciding if you want to prepare a sweet or savoury board. Sweet boards are a great alternative to traditional dessert. Guests don’t have to commit to a full served plate of sweets, allowing them to graze and choose from a variety of options. Cheese has also been said to aid with digestion – so a sweet cheese board is the perfect finale to a big dinner. Savoury appetizer boards are all about what you choose to complement the cheese. If you aren’t serving a full meal and the focus is on appetizers, you can have fun experimenting with heavier food options. Once you’ve selected the type of board you want to build, then it’s on to choosing what you will put on that board! Jellybeans, macarons, candied ginger, donuts, pastries, corn or banana bread, dates, biscotti and dark chocolate (at least 70%) pair well with cheese. Serve accompaniments for cheese dipping! Honey, maple syrup, jam, chutney and balsamic reductions (a surprising addition) balance the salt in the cheese well. Texture is always important. Soft cheese, hard cheese, crunchy things, crispy things, juicy things…lots of things! 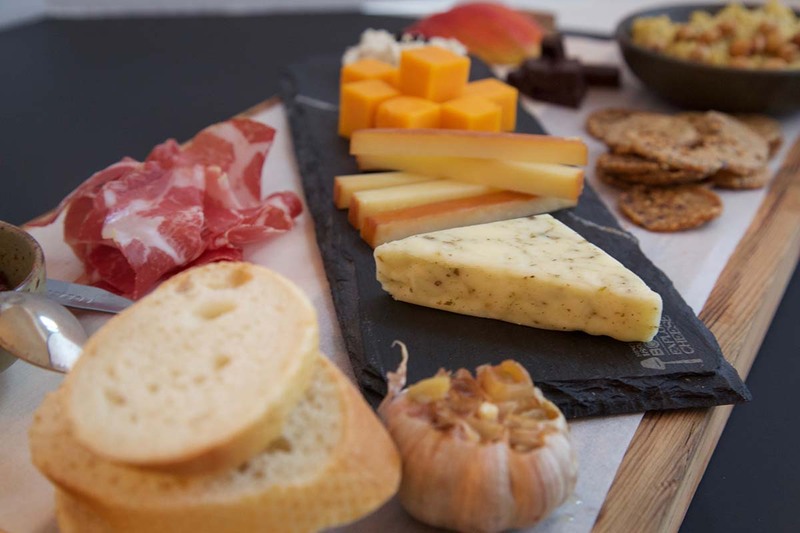 Include a variety of cheese profiles – blues, aged and mild Cheddar, Swiss and nutty Edam, for example. Think outside the cheese board: Chocolate fondue is great with cheese curds! Add substance with whole grain crackers, crusty ancient grain bread, whole wheat naan or bannock. Include a range of cheese textures and profiles. Take a crack at making some simple Parmesan Crisps for added contrast. 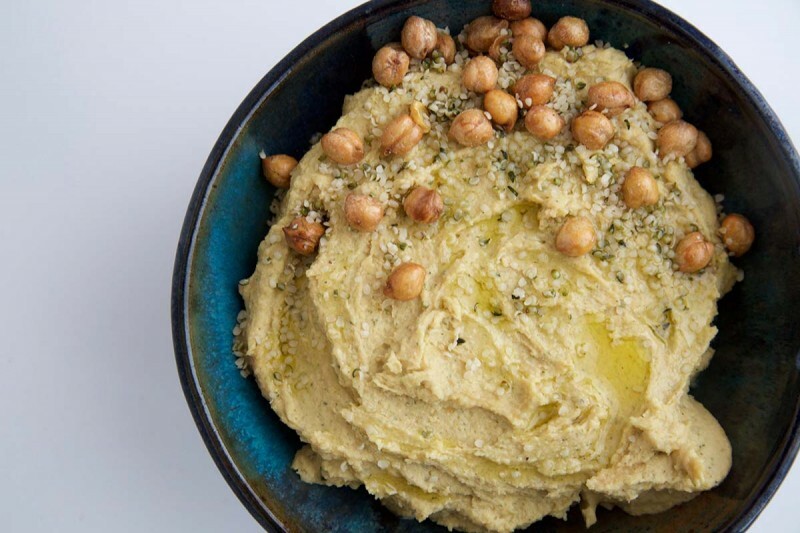 Use hearty accompaniments – grainy mustard, hummus, olive tapenade, roasted garlic cloves and kimchee. Your food pairings still need some sweetness to balance the salt. Dried or fresh fruit, crackers baked with fruit and seeds or sweet buttery croissants (or chocolate croissants!). Mix it up with pickled items (beans, asparagus, carrots etc. ), marinated veggies (artichokes, peppers and olives) and stuffed items (garlic stuffed olives & cheese stuffed peppers). Nuts and seeds are great for snacking on and complement the profiles of most cheeses very well. Cured or naturally smoked meats are also a great addition. Most retailers now sell variety packs of Italian meats. And many local independent retailers or butchers also have a wonderful selection of fresh natural premium meats and can recommend proper quantities. ENCOURAGE DISCOVERY – Have guests build their own mini cheese board by providing personal boards and utensils. 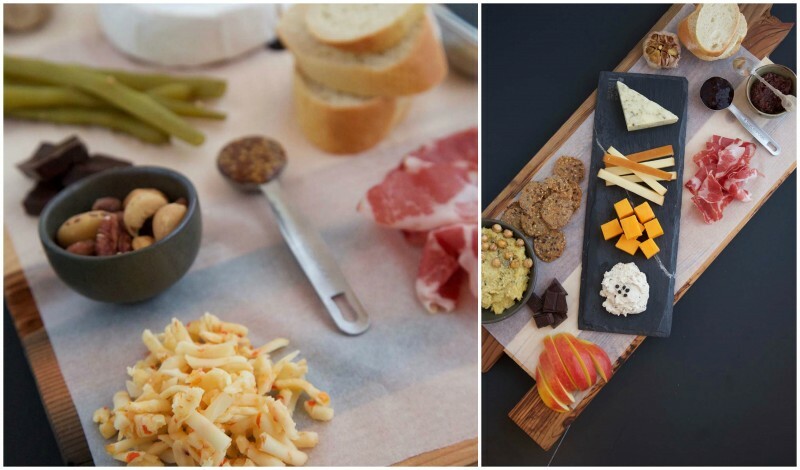 Customized boards will give them the freedom to discover pairings and flavour combinations. Your board doesn’t have to be perfect. In fact, messy is the new perfect. Pile, scatter, fan, stack and build, build, build. Use steel measuring spoons to serve accompaniments. 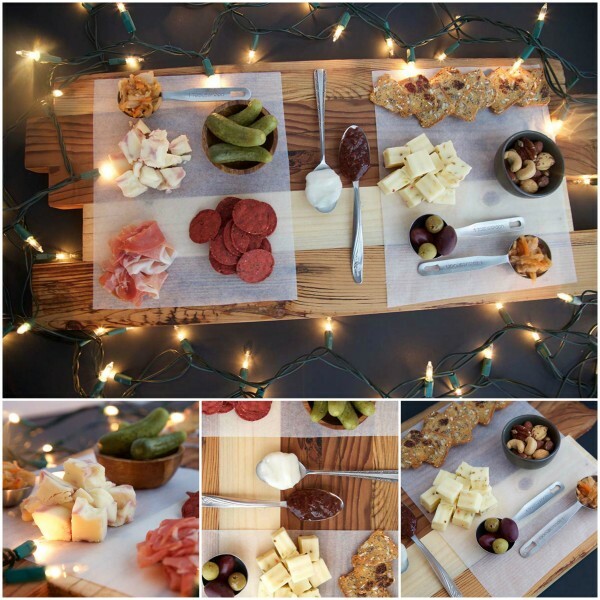 Helps make your food pop and add another dimension to boards with parchment paper. This also makes clean-up easier! Showcase dips and sauces in bowls and cheese on plates – then place them on the board to create more interest. We recently read that you should “Never Ever Cube the Cheese. Unless the board is for people under the age of 10“. We don’t agree entirely with this statement. Although uncut cheese makes for an artisinal and eye catching board, this method is sometimes not functional – for instance with large groups. Also, some folks are intimidated when they have to cut their own pieces. There is a place for both methods, just gauge what you should do based on your invite list. With that in mind – either leave blocks whole for a self serve approach or cut cheese into different shapes. Smoked product is conducive to sticks (you can see more of the smoke colour on the rind), while traditional cheese is generally cubed or sliced. Soft cheese can be spread and wheels can be cut into wedges. Get creative! Try shredding some cheese so guests can sprinkle away. Ensure your board is nutritionally balanced – check out this post from our official Registered Dietitian, Nita Sharda of Carrots & Cake. When serving cheese as part of a tasting event where it is the star, you will want a substantial amount of product – approximately 250 g total per person. More information about calculating quantities for entertaining can be found on the Dairy Farmers of Canada Dairy Goodness website.